A retro styled game where the player can use his own music playlist to determine how the environment reacts. Ryuki got to grips with Rush Bros. I hate most of today’s popular music; I wont lie about that fact. It’s not because I hate a particular genre of music per se, more for the fact that every 5~10 years the human race tends to find a fad and stick with it, thus oversaturating the entertainment medium. I got a copy of ,strong>Rush Bros. and upon looking at the quick press overview for the game I realized this was going to be a game that exploits the whole popular wave of electronic music that has hit most mainstream radio / TV stations and clubs. Honestly - I wasn’t looking forward to it. Oh how wrong I was to be so Cynical. Rush Bros. starts simply enough laying down the story in an old school cinematic NES style, almost like Ninja Gaiden meets Mega Man. The game basically revolves around two DJs, Bass and Treble, who used to be a duo, however they split one day when they want to gain more recognition through their own solo careers. However, a mysterious figure sees it fit to challenge the duo to a competition in which Bass and Treble compete against each other through a race. This competition makes up the rest of the game that is Rush Bros.
Basically the game revolves around instant pick-up and play with a drop-in and drop-out multiplayer functionality. You choose one of the 40 levels (All mostly unlocked) and start the game either solo or wait until you can compete against another online player (You can choose to play either Bass or Treble for each level and allow the other player to join to initiate a new split-screen session). 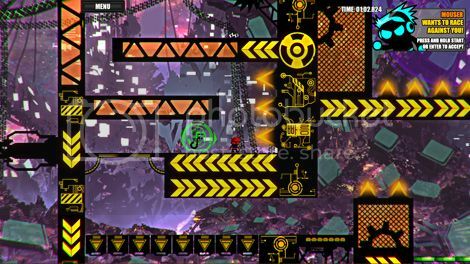 The levels and gameplay are in the style of a 2D puzzle-based challenging platformer similar somewhat to Super Meat Boy. There are tons of pitfalls and traps, however instead of outright making you ‘die’, they simply act as a hurdle to slow you down from completing the level. 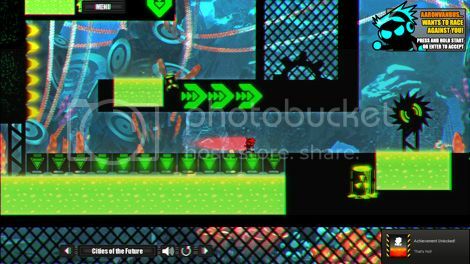 This style of level design fits in tune with the game’s competitive ‘race’ format. Sometimes you will collect ‘keys’ in the shape of musical notes that will allow you to open locked doors to progress through the rest of the level. To collect the keys sometimes takes a long and torturous round-about path with many obstacles and back-tracking. Whilst you are trying to complete the level, you are also trying to collect power-ups to help speed you up or make you double-jump so that you can traverse the level faster than your opponent. The level design is a bit of a mess in the earlier levels; most of the time power-up placement in feels unnecessary or unbalanced. In contrast, later levels that are much more difficult have a much tighter and better structural flow when it comes to challenges and item boosts. Some of the later levels are actually downright ingenious with computer style glitches you would see in old video games appearing randomly throughout the levels, sometimes making a whole floor disappear and re-appear very quickly. Needless to say the challenge of these levels is incredibly high as well as being a visual feast for the eyes. There are two challenge modes that allow you to play the level sped-up or a survivor mode that sees you take-on some of the game’s very lengthy and difficult courses with only one life (I seriously can’t fathom how people will complete the whole game like this, especially with the game’s already incredibly high level of difficulty). The controls feel quite tight for the most part, but it is a game suited for a controller. You CAN play with a keyboard, but don’t expect to be as successful as any opponent players with a controller will have an extreme advantage. Visually the game is very slick and has a very ‘modern retro’ vibe found in a lot of indie games nowadays. One downside is the colour palette can feel repetitively monochromatic at times. The music in Rush Bros. is all electronic, encompassing every popular electronic or club style you can think of. When you play the game, you will first notice that certain level obstacles such as spike traps or large looking ‘monitor speakers’ all rhythmically move to beat of the music that is playing at the time – The whole level itself pulses to the music you are playing!. 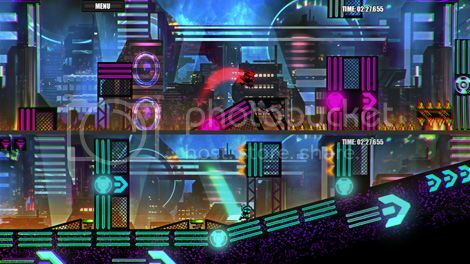 You can at anytime change the track and this will change the complete rhythm of every obstacle and trap within the level in real-time – its quite ingenious and I haven’t seen any other game use a real-time music mechanic like this. To make things even more enjoyable and interesting, you can put your own playlist of music into the game at any time. I found this a fantastic feature as you can really experiment to see how the level reacts to certain tracks whilst the tracks themselves become a total morale boost for your performance whilst you race other players. The stock soundtrack that comes with Rush Bros. sees many real-world artists collaborate in creating a wide range of electronic tunes, most of them pretty forgettable (As is the bane of the modern electronic musical genre), however there are one or two stand-out hits where you can’t deny the production is really fantastic and more importantly ‘feels right’ in the game. Overall, Rush Bros. is really a great game if you are into incredibly challenging multiplayer games that have an online leaderboard. The unique aspect of using music to your advantage to decide the flow of a level is pretty damn cool, however the level design leaves much to be desired sometimes and can feel repetitive without a coherent flow for a race format.